Wow! Love the colors. And pretty cool both books start with H. Is going to be a thing or just a happy accident? Also is there going to be a print copy at the same time as ebook? Thanks! So far, it’s just been accidental. I’d kind of like to do that for at least one more book, but we’ll see what happens. Now that I know how the print stuff works, I definitely want to at least try to get it out at the same time. Print takes longer because of having to wait for the delivery of the proof and approving that, so I guess it depends on how far I push the deadline. That cover is absolutely fantastic. I love the sense of motion. Fits perfectly with the theme. Thanks, Mike! I like how the first one fit in really well within the YA Paranormal Romance genre (Should be just call that the Twilight genre or the Teen Vamp genre?) but that this one has more of a comic book hero feel to it. Or something. I do love me some comic book heroes! And Or somethings. Or somethings rule. 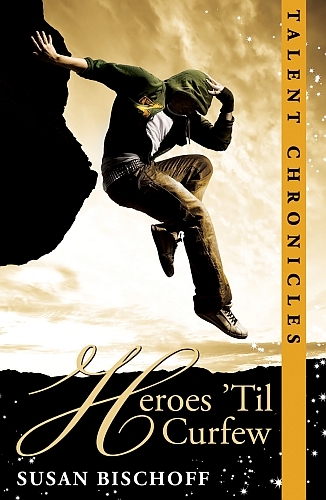 Looking forward to reading Heroes Till Curfew and finding out what Marco is going to do next. I don’t see him as the “let it be” type. He’s so not. Rotten little putz. I like! Is there a particular scene in the book that inspired this cover, or is it just the overall theme? I can’t wait to read it! There is a particular scene, and that scene is one of a few that with this theme of leaping, trusting that something’s going to be there to catch you. Or, more accurately, the cover reflects the the fact that I listen to Breaking Benjamin’s Break My Fall A LOT. I love the cover! I can hardly wait to find out who’s featured on the cover. Great cover! Posting a link on my FB! That cover is epic. His pose is just amazing! I love it, I really do. I didn’t know how another cover could possibly compare to the amazing cover of Hush Money, but this cover is really great. Aw, thank you, Corey. I was so lucky to find an artist like Robin to work with. Absolutely lovely. The composition is great and helps set the tone for the book, I’m sure. Thanks, Belinda! Seems like forever since I’ve seen your face. Hope everything is going well. I’m on pins and needles! Just finished “Hush Money” on my Nook and am ANXIOUSLY (read: Impatiently) awaiting “Heroes…”!! Thanks, Amanda! So glad that you liked it. Thanks, Jackson. I’m pleased that you approve the new cover. I hope the book lives up to it! I love the movement and energy in this. When Robin sent me the file I just went Wow. Omgoshness I couldn’t put this book down！ I finished it in like a day it’s a perfect balance of romance, comedy and everything else! Lol I wish that I had read the book layer on so I wouldn’t have to wait long for the second one to come out! Great job on the cover for heroes till curfew just like Hush money’s it’s perfect. Thanks so much, Stephanie. Your enthusiasm for Hush Money is the perfect start to my New Year’s morning. I’m glad you like the covers, too! Great Cover… I love Hush Money…. I can wait for your new releace of Heroes… can you please tell us the release day…..please!!!! Great book… just love it! Thank you, Adri. I don’t have a release date yet, but if you sign up for the newsletter, I can be sure to let you know. Thanks, Sydney!! I just put my daughter to bed and I’m working on it Right. Now. Thank you! Being a writer, at least for most people, is something you do very much alone. There’s really no one coming around, looking over your shoulder, telling you if you’re doing it right…until it’s done. I so appreciate it when readers take the time and make the effort to tell me (or to tell someone else) that they think I did a good job. I figure the least I can do in return for that gift is to try to find the time and the words to thank them. Well its awesome, and thanks, when I become a writer one day, I’ll remember you said that. It must me like an amazing feeling to know that people are reading something that you put so much time into and are enjoying it! That’s why I commented on this. Because you really are doing an awesome job. And I love it! I found Hush Money thru my Kindle. It’s new, a Christmas present…and I’ve been reading like mad. As a working mom of 3, reading has not been something I can do a lot of…BUT…I couldn’t stop reading Hush Money until I was done. As another said, after finishing, I *immediately*I looked for a sequel. Not to rush you or anything…~lol~….but keep it coming! Thanks so much, Ekatarina! I’m glad you enjoyed it. I’ll keep working on that sequel for you. OK … I just finished Hush Money (literally) and have moved from my iPhone (where I’ve been reading it), to my laptop ’cause I figure it will be easier to search FASTER for a sequel. I’ve signed up for the newsletter ’cause I don’t want to miss out on hearing that it’s ready. And then I read the feedback, and thought … I really want to say thank you for a brilliant introduction to the Talent series, I LOVE it. I thought maybe I shouldn’t post a message ’cause that would just distract you and take you away from the grind of finishing the next one (I REALLY wouldn’t want to do that, lol). But here I am, posting anyway. Ummmm … are you done yet? Are we there yet? Will it be available soon … will it, will it, will it??? Thanks for your comment, Trish! This morning you’re distracting me from cleaning up after breakfast and getting ready to go out and sell some Girl Scout cookies, so no foul there. Ah, the interference of life. I’m now hoping that the sequel will be beta’d, polished, and ready to go by the beginning of May, but no promises. Meanwhile, if you’re looking for more of the Talents, I do have a short story in an anthology called Kiss Me, Kill Me. Check out the Talent Chronicles page for links. And thanks again for you compliments. It’s always great to hear that someone enjoyed Hush Money and is looking forward to Heroes ‘Til Curfew. Marylin, I caught this in my email this morning and chuckled all through putting the girl’s lunch together. Thanks for making my morning! I love this comment, Paola, thank you so much. Creating Dylan = my pleasure! Hei! Just me bothering you again… is this book coming out this month? (may) Thanks! Cant wait! Hei! Just me bothering you… again! Is Heroes till curfew coming out in may? Thanks!